India is a land of abundant flora and fauna, some well known, such as the tiger and others relatively unheard of such as the caracal, a handsome looking animal; another of the cat species. In this book one gets to have a closer look at the line-up of thirteen different fascinating species of animalia. 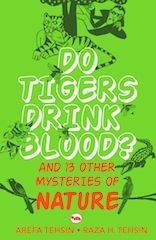 The authors brilliantly explain how each one is so extraordinary and unique providing the readers with fascinating, and often poignant snippets, a mixture of myth, facts and superstition surrounding these animals as well as hard-core scientific information. For instance, one gets to learn about the possible genesis of certain mis-representing myths: That bears hug people. Owls are to be feared. Snakes love music. And that tigers drink blood. Humourously presented, the book is filled with a great deal of interesting information and is quite a compelling read. It is perfect for children for their school projects or those who love animals. For that matter it would appeal to adults, too! It is definitely a book worth buying, as a child will not be satisfied reading it in one go. Their interest piqued, children will want to go back and read the pages again later, eager for some more information. About the authors: Dr Raza, is highly regarded as a biologist and writer and his daughter Arefa Tehsin has several books and magazine columns on wildlife to her credit. Young India Books strongly recommends.